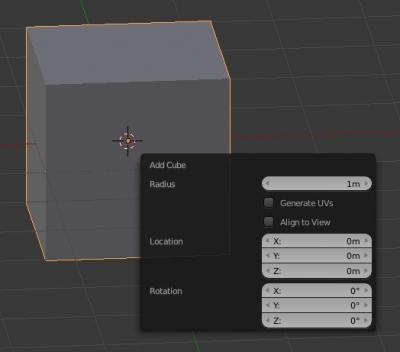 In addition to common panels (N/T/Properties) and their sub-panels, to display the user interface elements while developing Blender add-ons you can also use pop-up panels appearing on the screen when a user presses a certain key combination or perform any action. The simplest example of such panels is the panel that appears when the f6 key is pressed immediately after adding an object (shift+a) to the scene. Blender API provides developers the ability to create such panels for their add-ons. Let’s consider the creating of a pop-up panel as an example of the “Message box” window. Unlike basic panels that have their own ancestor class bpy.types.Panel, the pop-up panel is essentially an operator accessing certain Blender window manager functions so it is inherited from the standard bpy.types.Operator class. Let’s open the favorite code editor, create a basic body for the MessageBox class with the unique identifier “message.messagebox”, and also register this class in the Blender API. The function “invoke_props_dialog” creates the pop-up window what we need. In the function input parameters, we can specify the desired window sizes through the “width” and “height”. The first function parameter is a pointer to our current MessageBox (self) operator. In general, FINISHED will be returned by clicking the “OK button and CANCELLED – by closing the window (pressing Esc or clicking outside window area). Just calling the “invoke_props_dialog” function, only the base window with an empty frame and the “OK” button displayed. In order to place the necessary interface elements to it, we need to redefine the “draw” function of our operator. Elements placement is built through the common object “layout”. This is the final code of the operator. When called, it will display a window with the text message sent. In addition to text fields. any user interface elements – buttons, labels, checkboxes, input fields, etc. can be placed on such type of a window. This MessageBox class is fully functional for use in any Blender add-ons. It can be saved in a separate file and if the developed add-on requires the message output, you can import it and use its functionality.